She is a symbol of how far the OHS has come in helping Ottawa’s animals. 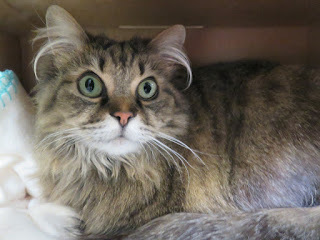 Hazel was admitted to the OHS as stray at 6 p.m. on the March 28. She was returned to her owner shortly after noon on the 30th — just 36 hours later. This isn’t typical. Most years only six per cent of cats are reunited with their families. But Hazel’s family saw her on the OHS website and called. Her family also decided to have her microchipped before she left, so she will have permanent identification should she ever get lost again. Technology is helping us reunite animals with their families.